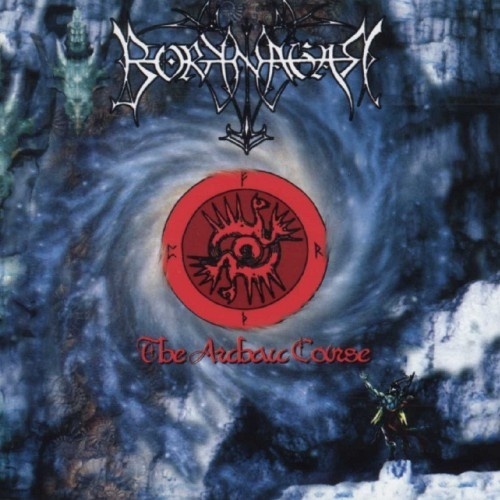 Borknagar's 1998 release, The Archaic Course, maintained the bold trajectory the band established on The Olden Domain, taking them even further from their black metal roots. After a series of four cacophonous but highly detailed numbers start the disc off with an extreme metal howl, the music subsides, and Borknagar's chaos theory gives way to a more thoughtful brand of metal. The sheer density of tracks like "Oceans Rise" and "The Witching Hour" is notable, as are the unending key changes that lend a unique symphonic element to the mix. A career-long struggle with production hinders the more aggressive early section of Archaic Course as heavily layered guitars and keyboards swarm into a throbbing white noise. This wash of sound might have been the desired effect, but such inarticulate production is an unlikely goal. During later, more progressive cuts, however, some precious room is allowed listeners, creating the opportunity to absorb the many vocal/guitar harmonies and other dynamic tricks. While a more detailed production would have helped The Archaic Course, the record is still an imaginative one that fans of Norway's Borknagar should enjoy.